← Coronation Party 1953, Elwy Drive/Coventry Drive. Mr Derek Bartley has kindly contributed this excellent article on the history of Rhyl Music Club. 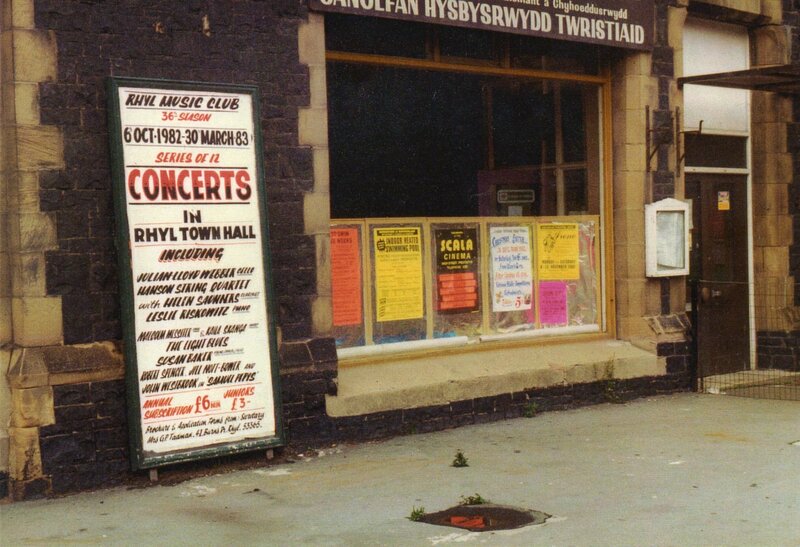 Rhyl Music Club was founded in 1947, a year that saw the foundation of other cultural bodies in Wales including the Welsh National Opera Company and the International Eisteddfod at Llangollen. The reason was easy to see; people, tired of the miseries of the war years were eager to grasp the opportunities to relax and enjoy the arts. However, such pleasures were not achieved without effort and the necessary inspiration had to come from somewhere. In the Music Club’s case it was due to the forceful personality and drive of Michael Lewis, a bank employee and a talented musician. To everyone’s surprise the fledgling Club attracted nearly 200 members in its first season, fully justifying Mr Lewis’ optimism. The first meeting, held in the Holborn Cafe, Wellington Road, in September 1947, drew 25 people and a Committee was formed under the Chairmanship of a Mr Barratt. Mr Lewis was appointed Music Organiser, retaining the position for many years while Mr Barratt found it necessary to relinquish the position of Chairman after very short time in favour of Mr Meurig Moelwyn Hughes, who distinguished himself by his energetic and enthusiastic direction. The inaugural concert, held in the Holborn Cafe on October 29th, was termed a ‘Members’ Concert’ while the second concert, on November 12th, featuring violinist Julian Shelley and pianist Gwyneth Hughes, was the first of the many to be given by professional musicians over the coming decades. Professional though they were they were also local people and Gwyneth Hughes, later to become wife of Colin Parry, was the daughter of Edward Hughes, first President of the Club. The first season progressed, reaching its climax with a visit to Rhyl of the BBC Welsh Orchestra, with Campoli as soloist in a brilliant performance of the Mendelssohn Violin Concerto. This concert, arranged by the Arts Council of Wales, and held at the Pavilion Theatre, was the first of many to be managed by the Music Club in the years to come. 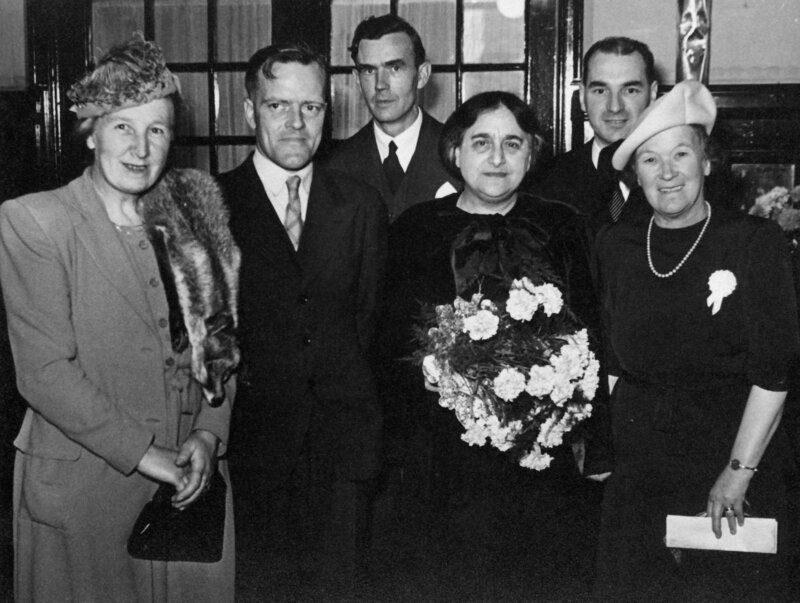 Flushed with success the Committee planned the following season carefully and were able to entice Dame Myra Hess to give a recital in the Pavilion Theatre. She was undoubtedly one of the best known of British pianists and much loved. Her lunchtime recitals in the National Gallery during the war years were extremely popular and in Rhyl the Pavilion was packed to overflowing. It had been a courageous venture for such a young club with slender resources but it paid off handsomely and a short while later Dame Myra sent a substantial contribution towards the piano the Club was now struggling to buy. From the outset, the Club had two chief aims. One was to ensure that all concerts were of the highest possible standard. As well as bringing to the town experienced artists, many of international repute, there was the intention to provide a platform for less experienced artists setting out on what would be an arduous career. In the following season the legendary pianist Alfred Cortot appeared, as did the famous Camden Trio, Archie Camden and Evelyn Rothwell, (better known as Lady Barbirolli), the outstanding oboist Leon Goossens and a 12 year old pianist named Thorunn Trigvasson from Iceland. Eventually she was to become Mrs Vladimir Ashkenazy, mother of pianist Vovka Ashkenazy who was to visit the Club some years later. Subsequent seasons saw the arrival of some great names, including pianists Benno Moiseiwitch and Denis Mathews and, unforgettably, contralto Kathleen Ferrier. With Kathleen came Gerald Moore (who insisted on being driven past Robins Cafe in order to show her where he had once played when giving a lecture recital). Venues used by the Club have varied a little. In time the Holborn Cafe proved inadequate for the numbers attending and so a move was made across the road to the Town Hall which then became its real home. The main purpose of the Club was and still is to provide chamber music and some vocal concerts and the Town Hall proved an admirable venue. For some years the Pavilion Theatre was also used, being the venue for the many large scale orchestral concerts arranged by the Club in conjunction with the Welsh Arts Council. In 1953 the Club presented one of the world’s greatest organists, Marcel Dupre, at St. Asaph Cathedral. That same season saw a visit by the world renowned Mozarteum of Salzburg, to give an all-Mozart concert at the Pavilion under their conductor Edouard van Reemortal, with Marie-Theresa Fourneau as soloist in the C minor Concerto K491 played, incidentally, on the Steinway piano recently bought by the Club. This concert, with its capacity audience, created the tradition of orchestral concerts to be presented by Rhyl Music Club and these formed an important part in the musical calendar of North Wales for many years. St. Thomas’ Church and Bodelwyddan Castle have also been used for isolated concerts and for a few years the school hall at Ysgol Dewi Sant became our home, but that is another story. Rather oddly, on one non-musical occasion the Odeon Cinema was used by the Club. This was in 1953, the year of Everest when, following the first ascent by Hillary and Tenzing, lecture tours were arranged by the London agent, Wilfrid van Wyck. He had struck up a warm friendship with Michael Lewis, and the Music Club was asked to arrange a lecture by Charles Evans and Wilfred Noyce. This was most successful drawing a very large audience and giving the Music Club valuable publicity. Eminently successful though this lecture was, it was a digression from the Club’s main function of providing music, a function at which the Club excelled. Some of the greatest of British and continental orchestras visited the town culminating in 1967, in time to mark the Club’s 21st Birthday, with a visit by the great Washington Symphony Orchestra – the ‘Orchestra of the President’. It was due to strong persuasion on the part of Michael Lewis and sympathetic support from Wilfrid van Wyck that the orchestra agreed to include Rhyl in its itinerary for its grand European tour, which read: Berlin, Vienna, Parma, Rome, Basle, Berne, Madrid, Antwerp, Monte Carlo, London – and Rhyl! The atmosphere at the packed Pavilion was electric and the fervour with which the three National Anthems were sung (yes, most of the Welsh audience knew the words to the American anthem) astounded the players who responded with great enthusiasm, giving an electrifying performance probably not matched in the other major venues on their tour. For the next twenty years or so, until the Pavilion was demolished, the Club was responsible for presenting three, sometimes four orchestral concerts per year under the direction of famous conductors and including famous soloists. Thanks must be given to Roy Bohana, Music Director of the Welsh Arts Council who planned the tours of these orchestras for including Rhyl in the list of venues. The arrangements here were made by Mrs Muriel Lewis, until her death, when the duty passed to Mrs Gwynedd Tadman. It was a chance meeting which had led to the warm and long-lasting friendship with Mr Wilfrid van Wyck, one of London’s leading music agents. This enabled the Club to promote concerts by internationally acclaimed, post-war artists such as pianists Julius Katchen, Gary Graffman and Andre Tchaikowski, to name but three of the very many who performed as soloists, in ensemble or as lecturers. This link with London kept us in close and vital touch with the international world of music. Closer to home was the Welsh National Opera Company, eventually to achieve international status itself. Regular visits were made by the Company and Richard Armstrong made his conducting debut in Rhyl in a performance of the ‘Marriage of Figaro’, conducting from the Club’s harpsichord in the manner of Mozart. It was a memorable performance and Richard’s later career, for some time as the Company’s Music Director, saw him make his international reputation as a conductor of Verdi and Janacek. Sadly, to everyone’s great disappointment, one planned concert, exciting in prospect, did not take place. It was to be given by Benjamin Britten and Peter Pears. They were already in the town but as a mark of respect, following the news of the death of King George VI that day, the concert was cancelled. For the Music Organiser and Chairman, however, all was not lost for they were able to entertain the two great men to dinner and later at home with a great deal of music. Only a few years later the authorities made their controversial decision to pull down the Pavilion Theatre. A long-standing musical age came to an end for the Pavilion had been the venue for many great municipal events, none more so than the concerts by the many great orchestras, conductors and soloists presented by the Club. The Hallé, The Sophia Philharmonic, the LSO, The Mozarteum, The Prague Symphony and other world renowned orchestras came to Rhyl, with conductors such as Sir John Barbirolli and soloists such as violinist Igor Oistrakh. All had appeared but now the stage was not only empty but non-existent and the Club was from now on limited to the Town Hall with its woefully inadequate facilities for visiting artists. The Town Hall did have one important blessing, however, and that was its warm acoustic which suited well our new piano, a fine Bösendorfer, obtained largely through the endeavours of Dr. and Mrs Green. Photograph above shows a poster advertising the 1983 season. While these notable concerts were taking place at the Pavilion the normal fortnightly concerts were still being arranged and, while the range of musical events in Rhyl had now narrowed somewhat, the standards remained high. The Club enjoyed visits from famous string quartets such as the Amadeus, the Allegri and the Endellion, and solo pianists ranging from Martha Argerich, fresh from her triumph in Warsaw, to John Lill and John Ogdon. With all these wonderful artists a firm friendship developed and, after the resignation of the Bishop of St. Asaph as President, John Lill was approached. With his busy life and wide-ranging commitments, he was at first concerned that he would not be able to do justice to the position, but he was persuaded and, for the Club’s 40th Birthday, in 1987, we were able to welcome him to Rhyl as our new President when he gave a memorable performance. This concert took place at a time when the Club was once again temporarily homeless. Amid much controversy the Town Hall had been declared unsafe and was closed for some years. Plans to convert it to a supermarket fortunately came to nothing and to the town’s lasting benefit funds were found to refurbish it so that we now have one of the best halls in Wales. For a period of a few years, therefore, we had need once again to find a new venue. With the valuable support of the Headmaster we were able to use the school hall of Ysgol Dewi Sant in Rhuddlan Road. This did not mean a lessening of standards, however, and in the period visits were made by more famous names, including pianists Louis Kentner and Olli Mustonen, violinist Nigel Kennedy, soprano Rebecca Evans and especially the by now world famous baritone, Bryn Terfel. The first half of our 1989/1990 season was held at the school but, in conjunction with the Borough Council, in January 1990 we were able to hold a Gala Concert to mark the re-opening of the Town Hall. The splendid occasion was marked by a performance by the Philharmonia of North Wales, conducted by Rupert de Cruz, although the event was also an extremely sad one for the Club. On the very day of the concert our long serving and dedicated Music Organiser, Michael Lewis MBE, passed away. He had deservedly been awarded the MBE for services to music and the musical world of North Wales was the poorer for his passing. Following this concert it was seen that while full scale orchestras were beyond our reach chamber orchestras could perform well at the Town Hall, although as a rule the expense involved was prohibitive. We were fortunate in that Roy Bohana, of the Welsh Arts Council, was eager to introduce chamber orchestras from Eastern Europe at affordable rates and so for a number of seasons we were able to enjoy wonderful concerts by a number of outstanding orchestras. On Roy’s retirement some resulting reorganisation took place within the Arts Council of Wales and these tours came to an end but, even so, since then we have been able on one or two occasions to present by our own efforts ensembles such as the Goldberg, the Manchester Camerata and in recent seasons the Welsh Chamber Orchestra. Following Michael Lewis’s death Derek Bartley assumed the role of Concert Organiser, eventually combining the role with that of Publicity Officer and, with a most enthusiastic Committee currently under the Chairmanship of John Bennett, the Club continues to flourish. The Club has long enjoyed association with other musical bodies in North Wales. The North Wales Arts Association (now the Arts Council of Wales) has played an important part, obviously, but the Club has had close links with St. Asaph Choral Society and also helped to establish the annual performance of the St. Matthew Passion at the Church of Corpus Christi at Tremeirchion, where Michael Lewis was the conductor there for many years. In the mid-nineties, mainly through the efforts of Committee members Derek Bartley and Glyn Cuffin, the Club was closely associated with the Rhyl & District Easter Arts Festival. This innovative Festival enjoyed only two years of life before local government reorganisation brought it to a premature end but in that time a wide variety of art forms were presented. Under the direction of Anthony Hose, with whom the Club still enjoys a warm relationship for he is Principal Conductor and Artistic Director of the Welsh Chamber Orchestra, a large number of instrumental, orchestral and operatic works were heard, divided between the New Pavilion Theatre and the Town Hall. Singers included the famous baritone Dimitri Hrovostovsky, soprano Rebecca Evans, while orchestras included the Royal Liverpool Philharmonic and the North Wales Youth Orchestra – and also instrumental groups such as the Jacque Loussier trio. While most of the concerts presented by the Club feature professional artists concerts by local artists and young musicians are seen as part of the Club’s role and each year a ‘Young Musicians Concert’ provides a platform for young, aspiring artists from the locality. This policy, supported by funds from the Mary Woolcock Fund, has been of great value to many artists who have gone on to make a career in the world of music: the internationally renowned baritone Stephen Roberts, of Rhyl, being but one of many. It would take too long to name all the artists and ensembles, ranging from soloists to orchestras, who have appeared at Rhyl. Many of them frequently appear on concert platforms world-wide and enjoy great renown. However, their performances are only part of the story. The Club owes its success and vigour to half a century’s work by many people, some, alas, no longer with us. Apart from the indefatigable Michael Lewis the Club owes a great debt of gratitude to his wife Muriel. As Publicity Secretary she made many of Michael’s ideas work and in her memory the Muriel Lewis Award was established to encourage young artists from the locality. Following Muriel’s death Gwynedd Tadman stepped in as Publicity Officer, continuing the work with the same vigour and enthusiasm, and on her retirement from the post Derek Bartley took over. It is invidious to mention some names and exclude many others but any account of the Club’s activities must include the name of Kay Arthur, as performer, Committee Member, Vice-Chairman. We have been fortunate in our choices of Chairman, for each one has made his or her own contribution. Moelwyn Hughes, Mary Ault, W.M. Jones, Rodney Green and June Arnold took the Club forward until John Todd became Chairman and fulfilled the role with flair for many years. He was succeeded by Bill Hollinson who was sadly able to complete only two years before ill-health made it necessary for him to step down. In 1997 the 50th Anniversary Season commenced under the Chairmanship of John Bennett and the following decade saw the Club maintain a strong membership and high standards. Many concerts are given by young artists whose reputations are growing for we continue to ensure that youth is well represented. Other concerts are performed by outstanding musicians who have earned international acclaim. This year’s summer Celebrity Concert was given by the increasingly noted Welsh pianist Llyr Williams. Before this, and looking back just a few seasons, in 2002/3 we heard the internationally renowned pianists Kathryn Stott and Noriko Ogawa, playing as a duo, while early in 2004 we welcomed pianist Gordon Fergus Thompson. To end the season 2004/2005 we were privileged to hear an outstanding recital by our Club President, John Lill CBE. 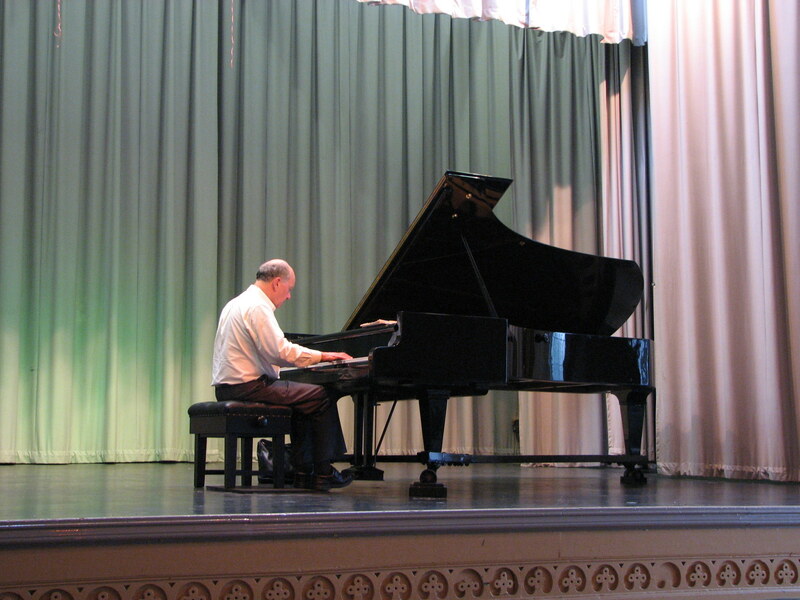 This concert was given free of charge as a gift to the Club – a most generous gesture by one of the world’s outstanding pianists. The season, our 58th, began as it ended, in splendid fashion with a concert by the Welsh Chamber Orchestra, featuring a brilliant young violinist, Alexandra Wood in a sparkling performance of Mozart’s Fourth Violin Concerto. The preparations for this highlight concert were fraught with difficulties not least being the fact that conductor Anthony Hose, was detained in the USA only days before the concert. The noted conductor James Lockhart stood in at short notice and the evening was a resounding success. The 59th Season saw two large ensembles open and close the season when Welsh Chamber Orchestra returned once more in October and the Yorkshire Imperial Urquhart Travel Band brought things to a resounding close in March. The ten concerts sandwiched between these featured soloists, duos, trios, quartets and vocal concerts – all maintaining the high standard expected of the Club. We then began our 60th Anniversary Season with a return by the Welsh Chamber Orchestra followed once again by a series of splendid concerts. There was to be a slight retrospective feel to the season by ensuring that at least one musician at each concert would be making a return visit. The season as a whole was a great success and we saw return visits by a number of old friends, to be rounded off by an Anniversary Celebration Social Evening in June at which noted Jazz pianist Huw Warren will entertain us after a pleasant buffet at the Town Hall. The 61st Season commenced in October 2007 with the opening concert being given by our president, John Lill CBE, to mark the Club’s 60th Birthday. This splendid recital set the tone for the whole season which saw some remarkable talents on display. In May, 2008, at the Annual General Meeting, Derek Bartley, Concert Organiser for twenty years, retired from the joint positions of Concert Organiser and Publicity Officer. Mr Dennis Gannon took on the role of Concert Organiser while Mr Stephen Leeder became Publicity Officer. Sadly, no sooner had they settled into the work our Treasurer, Mr John Chettleburgh passed away. Dennis Gannon promptly moved to become Treasurer and Stephen Leeder became Concert Organiser, while the unofficial role of Stage Manager, otherwise known as our ‘Wednesday Man’ was undertaken by Membership Secretary Alan Mival. Another Publicity Officer was required and in 2010 Mr David Birch was appointed. In the New Year’s Honours List of that year, 2010, Derek Bartley was awarded MBE for Services to the Midland Association of Mountaineers and to Rhyl Music Club. Withdrawal of funding by the Arts Council of Wales was quite a blow but renewed efforts at fundraising produced sufficient income to offset the severe financial loss from ACofW and, although membership in 2011-2012 has dropped appreciably the Club is still in very good health, as the concerts enjoyed throughout the season have shown. The record of Rhyl Music Club is a proud one. It has provided much to the cultural life, not only of the town of Rhyl, but to North Wales in general and, with a loyal and enthusiastic membership, now looks forward to presenting its 66th Season in October 2012. It’s been a habit of mine to post a comment whenever I notice a good blog or I have something worthy of sharing. In many instances, my action is triggered by a serious interest in the article I read. Your BLOG TITLE certainly triggered me to think hard enough. There are actually several things that I wish to ask you if you don’t mind. Is it just me or other site visitors don’t appreciate this blog as much as I do? In case you also post on other social sites, then I wish to get updates at the same time. Would you mind listing down your public web sites like Twitter, Facebook, or Linkedin? and coverage! Keep up the excellent works guys I’ve added you guys to my personal blogroll. My mother remembers having violin lessons at Holywell grammar school in the 19402taught by Julian Shelley and oftein remarks that she would love to see a photo of him. Do you know if there is one available?